Six months ago, Ordo Veritatis agent John Sheldon went off the organisations radar following an emotional breakdown in the wake of loosing his wife in a car crash. He held his sister, fellow Ordo Vertiatis agent Caroline Sheldon, responsible for her death as she was drunk at the wheel that night. Psychiatric Metrics feared John went out to perform a solo mission to expose the heart of an Esoterrorist funding network he had uncovered in Amsterdam. The proposal for that mission had been shelved months ago due to its low probability of success. When his body turns up in Amsterdam, evidently the sacrifice in an Esoterrorist ritual, the eye of suspicion turns on you and the rest of the team Sheldon left behind. Are you guilty by mere association, or are you innocent of his fate? You have to find out what happened to your friend and colleague, and in the process clear your name in the eyes of the Ordo Veritatis. 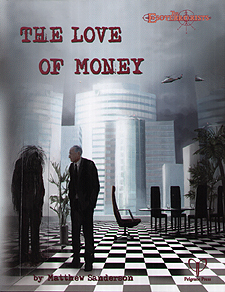 The Love of Money is an Esoterrorists adventure for 4-6 players from experienced GM and Pelgrane Crew favourite, Matthew Sanderson. It is designed as a single stand-alone adventure with pre-generated characters provided, but can be tweaked to accommodate integration into an ongoing campaign.